Rio Verde is a community located in Maricopa County, Arizona. It has a population of 1,811 residents and rests on 5.4 square miles of land. Rio Verde is a member owned and governed active adult golf community. Its location sits adjacent to the Tonto National Forest and near the Verde River. There are wonderful views of the Yavapai Nation Indian Reservation. There are a total of 980 homes in the community. Residents enjoy the Rio Verde Country Club, which features two 18-hole championship courses. There is also a community center that has a library, card rooms, exercise room, art studio, a dance studio, and much more. There are many beautiful homes in the community for residents to choose from. The majority of them are single family style homes. Come and see what Rio Verde can offer you. The median home value is $481,800. The home value rate has risen by 7.4% in the last year and it’s predicted to rise by another 4.6% in the coming year. 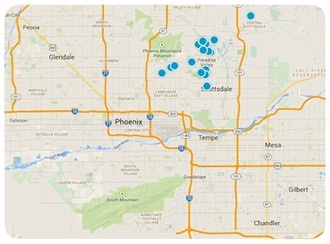 The median price per square foot is $191 and this is higher than Phoenix Metro’s median of $124. If you are interested in purchasing a home in Rio Verde, contact us today for more information.